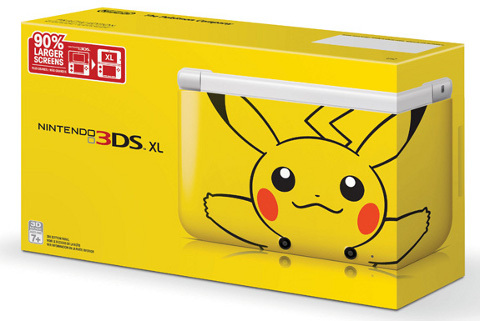 The Pikachu Edition of the Nintendo 3DS XL handheld is making its way to North America. The Pikachu 3DS XL, previously released in Japan, will debut here on March 24th. The yellow handheld is emblazoned with the face of Pikachu, the mascot for the Pokemon franchise. The $199.99 handheld is also bundled with a 4GB SD memory card. It doesn't come with any games, though. The Pikachu 3DS will be launching alongside series spin-off Pokemon Mystery Dungeon: Gates to Infinity. In Gates to Infinity, players take on the role of a Pokemon and explore randomly generated dungeons. They'll recruit other Pokemon to their team along the way. To find portals to new dungeons, players use the 3DS Camera to scan circular objects in the real world. Even though the Pikachu 3DS XL and Gates to Infinity aren't sold together, Nintendo would sure like it if you bought both. If you register a 3DS XL and a copy of Infinity or Luigi's Mansion: Dark Moon (arriving the same day) through Club Nintendo by April 30th, you'll get a voucher for a free game. You'll be able to choose between these games: Super Mario 3D Land, Professor Layton and the Miracle Mask, Art Academy: Lessons for Everyone!, Freakyforms Deluxe: Your Creations, Alive! and Star Fox 64 3D. The other incentive for buying this 3DS model early is that it probably won't stay in stores too long. A lot of Pokemon fans are no doubt looking to grab a 3DS with X and Y coming this fall.